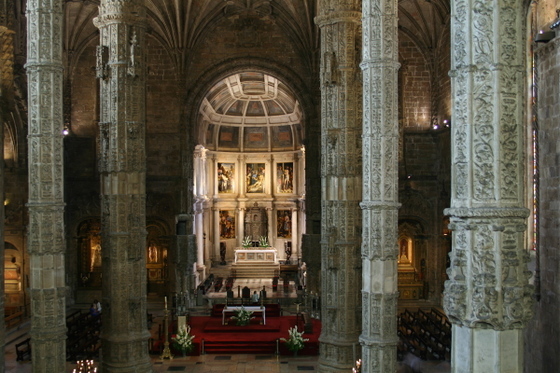 Perhaps part of why I liked Portugal so much is that only a small percentage of the "must sees" have to do with churches. Don't get me wrong, I liked Belgium too, but I never need to see another baroque church as long as I live. I got my share in one little country. 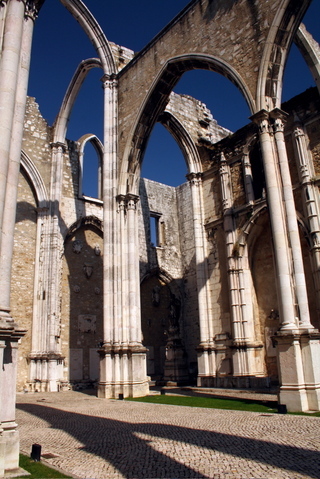 First the Carmo Convent - Its a church that was destroyed in the great earthquake of 1755 leaving only its shell remaining. Inside the little gift shop area was two mummified children of about 8 years of age who were each squeezed into a 1x2 foot glass box for the world to walk by every day. 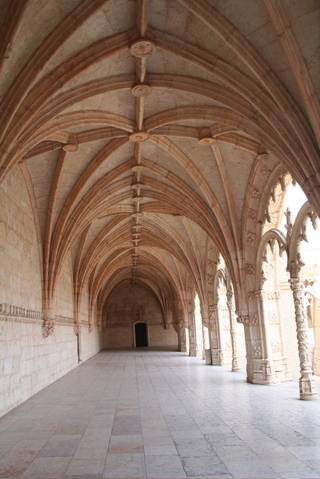 It was really morbidly fascinating and as far as I could see had little relevance to the convent itself. I wasn't allowed to take pictures of them, so you'll have to trust me. 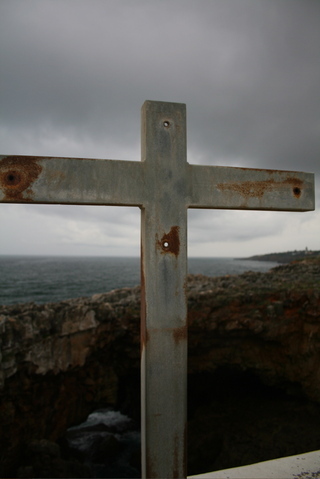 One day I spent almost 5 hours just sitting on the edge of Portugal near Cascais reading The Brooklyn Follies and wandering further up the coast every hour or so, or whenever it started raining onto my book. Along the way I came across El Boca Do Inferno! 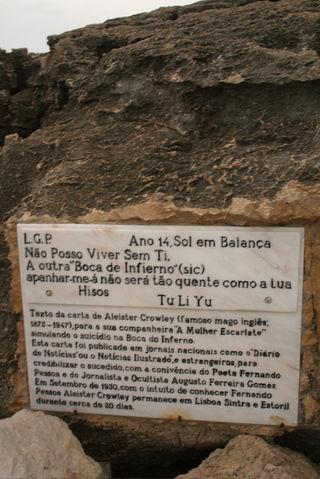 Its significant to this post because at the top of El Boca Do Inferno! is a little chapel with a little cross that keeps the devil away, I'm assuming. And the language police would also like to apologize that the original namer of El Boca Do Inferno! did not use spell check. 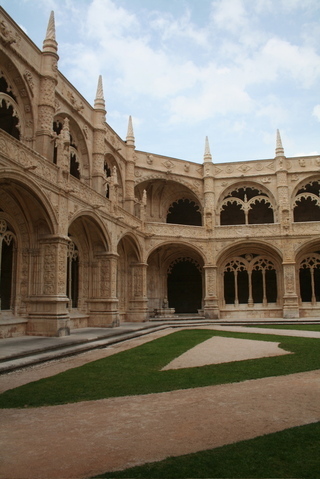 And lastly the Jeronimos Monastery in Belem, the most peaceful place I may ever have been in my life. The cloisters were so lovely, too lovely to put into words. And here is inside the actual church part. There was no flash allowed so I couldn't take a clear picture of a statue of a little saint who was stepping on the heads of 6 children. I'm getting the feeling that the Portuguese have an odd relationship with childhood. Just to say that you have taken the most beautiful pictures of my country that I have seen lately. I was born in Lisbon but now I live in Alentejo (southern Portugal). Please do come back and visit other cities. 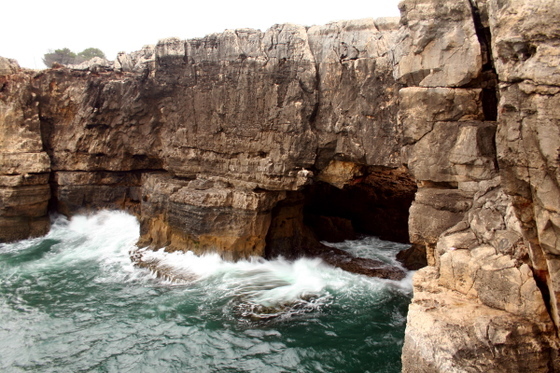 And if you allow me it´s called "Boca do Inferno" without the El. El is a Spanish word not Portuguese. 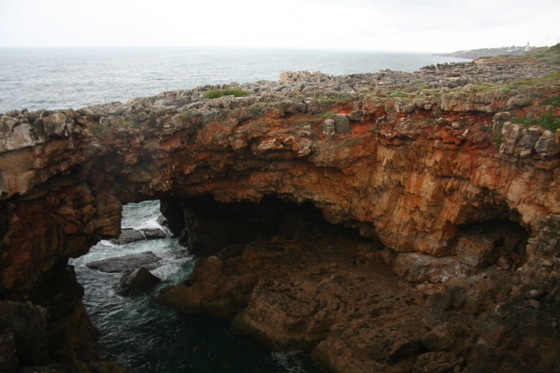 You can say " A Boca do Inferno" but in this case it´s just "Boca do Inferno"
Thank you for showing my country. Thank you for the lovely compliment, but taking beautiful pictures of Portugal isn't hard, its a remarkable place. 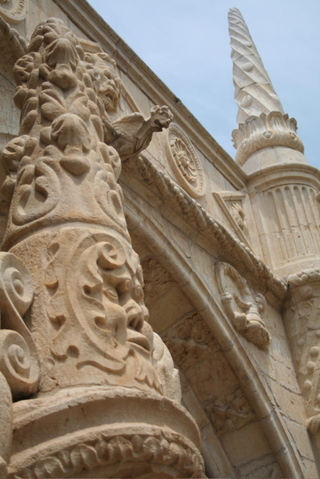 I can't wait to visit the northern AND southern parts of Portugal, as soon as I get my nerve up to rent a car. Sorry for misunderstanding the "El" thing, Portuguese is close to Spanish, but I"m sure I made a fool of myself many time while I was there by taking liberties with speaking with my bad Spanish rather than miming what I wanted. I´m sure you didn´t made a fool of yourself because eveybody in Portugal understand and can speak Spanish rather than spanish people that can´t say a word or understand Portuguese. But I can garantee you that no one get´s offended or think your fool. And by the way, sorry for my miss-spelling. If you need something or to ask something fell free to contact me. 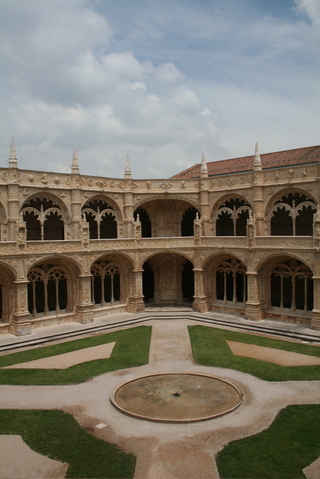 What is dominant religion in Portugal? Dominant or primary industry? Type of government? Natural resources?